New details have been revealed about a feature of the upcoming expansion to Age of Wushu: Winds of Destiny, including info about the back-story behind the new region and accompanying the new game features. The added region, known as Heaven’s Lake and Snowy Peaks, is located in a new environment with snowy and mountainous terrain. In the region, the city of Lingxiao becomes the focal point for the conflict. The city’s ruler, the local elder Wang Yue, is at odds with 3 rival groups: the Snowy Valley people, the Blood Blade Clan, and the Valley of Frozen Souls. Players who choose to join in the battle are randomly placed on one of these four factions, with the ultimate goal of acquiring the most points for their team. The event is multi-staged, culminating in a battle in which the Lingxiao forces defend the city as the other factions attack. 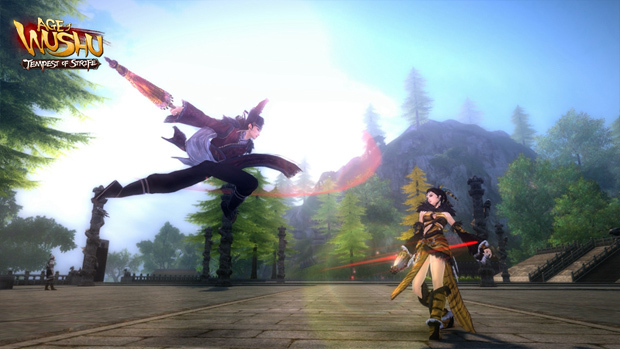 Perfect World has released new screenshots for its upcoming expansion to RaiderZ, Broken Silence. Mail.Ru Games has announced an Autumn event extravaganza for RiotZone.